Are you tired of the traditional team building events that leave your employees feeling unstimulated and unentertained? Are you looking for a fun and exciting way for your employees to practice teamwork while engaging in some friendly competition and having fun? Are you searching for the perfect team building experience for your next event to boost morale and encourage production? At Game Shows Alive, we have the answer to all your team building needs, to make it a fun, fresh and exciting experience that achieves all your team building goals! How Does Game Shows Alive Help With Team Building Activities? The possibilities are endless! Game Shows Alive can be used for corporate games and team building activities, corporate meetings, training seminars, annual conventions, trade shows, fundraisers, schools, and colleges. The concept allows people to try their hand at the game show style format, encouraging teamwork, critical thinking skills and general knowledge, depending on the type of game show style at the event. Our unique concept combines audience interaction with team play and team building, allowing all participants to contribute to the event while performing different roles. It’s a great way to get to know colleagues, guests and friends in a competitive and fun way, by engaging in an exciting live performance! What Show Formats Can Employees Participate In? 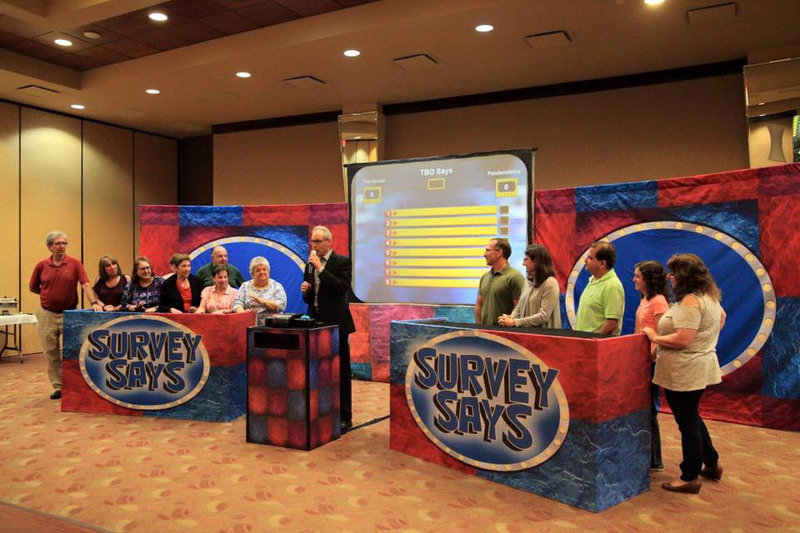 Create an event unlike any other with any of our shows, like favorite TV shows such as “Family Feud,” “Jeopardy,” “Wheel of Fortune” and many more, or we can create one just for you! These memorable shows will motivate and stimulate any audience and encourage team building and communication! The Cruise Director – All the fun and interactive play found on the most popular cruise ships, without leaving land! How Is Team Building Encouraged? How well the team can work together often measures how much the team can do. Game Shows Alive can organize many Team Building Activities that can accomplish your goals. Team building is a vital part of company life, and having open and easy communication channels between employees and employers makes the working environment more productive and efficient. However, as the workplace incorporates people who differ in a lot of ways and are in different leadership positions, sometimes tension and conflict can arise. Team building is an important skill to encourage cooperation and positivity. It allows coworkers to interact with each other in a non-working, informal environment, getting to know each other personally, while engaging in activities that require a different type of skill, sometimes testing their critical thinking skills, sometimes their logic, and other times their general knowledge. Team building puts the fun back in work functions! If you’ve noticed a dip in productivity at work or a workplace environment that doesn’t reflect the friendly environment you’re aiming for, team building may just be your answer. For the best morale-building, skill-testing experience in a fun and engaging environment for all your employees, call Game Shows Alive now on 954-282-1803 to find out more about creating your perfect team building event!